Achieves perfect, reproducible results every time. Equipped with advanced performance features such as effective bumping and cross contamination protection, precise temperature regulation and easy to use controls. Rocket 4D Synergy is a fully automated system for drying or concentrating very large volumes with no user intervention and in complete confidence –no bumping, foaming or sample loss. Simply load your sample, select the correct method,press start, and walk away –the system will do the rest.The Rocket 4D Synergy can also befitted with a removable flask rotor to accommodate the full range of Rocket Sample handling solutions such as flasks, tubes and SampleGenie. 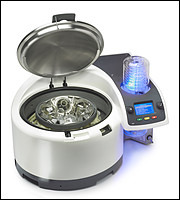 SampleGenie™ enables samples to be concentrated or dried directly into the storage or autosampler vial without the need for manual transfers or graduated washing steps. Saves time and eliminates handling errors. It is constructed from borosilicate glass and is compatible with most extraction solvents. SampleGenie may be used with HCl, however seal lifetime will be reduced. For full product brochure, please click here. Scroll to page 8 for mechanical data.